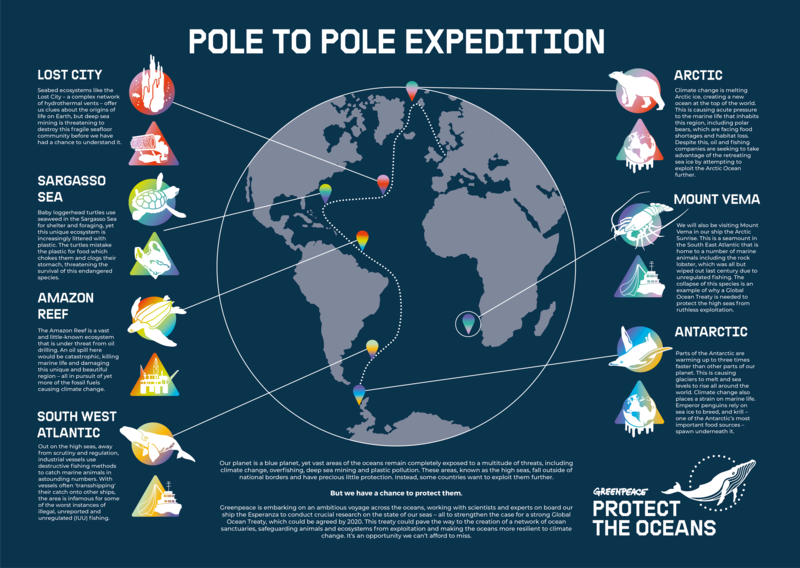 Greenpeace launches one of its biggest ever expeditions – an almost year-long pole to pole voyage from the Arctic to the Antarctic – to highlight the many threats facing the oceans and to campaign for a Global Ocean Treaty covering all seas outside of national waters. Visiting many of the areas identified as in need of protection by the groundbreaking academic study 30×30: A Blueprint for Ocean Protection, released last week, the Protect the Oceans expedition will see scientists and campaigners team up to research the threats of climate change, overfishing, plastic pollution, deep sea mining and oil drilling. The Greenpeace ship Esperanza is in London this week ahead of the expedition, which is being launched at an event on Thursday evening in London’s City Hall on the River Thames, with the UK Environment Secretary Michael Gove MP, Shadow Foreign Secretary Emily Thornberry MP and marine biologist and co-author of the 30×30 report Professor Callum Roberts. See here for a map of the route. Arctic: The Greenpeace ship Esperanza will depart from London this week to head to the Arctic, where a multidisciplinary team of climate scientists and marine biologists will investigate the impact of climate change on the region and its wildlife, including whales and polar bears. Further details will be announced soon. Lost City: From there the crew will dive almost a kilometre down to the so-called Lost City in the mid-Atlantic, a complex seafloor ecosystem of hydrothermal vents which is thought to harbour clues to the origins of life on Earth. Licences to explore deep sea mining in the area have recently been granted, which could cause irreversible biodiversity loss. Sargasso Sea: Journeying to the Sargasso Sea, the team will research the impact of plastic pollution on this ecosystem and its wildlife, where floating forests of seaweed create a unique environment which is a crucial refuge for young sea turtles and a spawning ground for eels. Amazon Reef: North of Brazil and in French Guiana, the expedition will explore a unique and pristine ecosystem recently revealed to the world at the Amazon mouth basin. Here the world’s greatest river meets the ocean and complex forests of delicate corals and sponges are home to colourful fish, whales and sea turtles. Companies want to drill for oil in this region, where a spill would have devastating effects on marine life. Mount Vema: A second Greenpeace ship, the Arctic Sunrise, will visit Mount Vema, off the west coast of Africa, an incredible and diverse seamount which reaches to 7m below the surface but has been devastated by historic industrial fishing. South West Atlantic: The Esperanza will shine a light on the wild west of industrial fishing in the South Atlantic, where some of the worst instances of illegal, unreported and unregulated fishing take place. Antarctic: The Esperanza will arrive in the Antarctic in early 2020. This fragile ecosystem is home to penguins, colossal squid and the great whales, but is under threat from a changing climate and industrial fishing. See here for a map of the pole to pole expedition route. The Esperanza is operated by Greenpeace International. See Media Contact section for expedition enquiries, including for media interested in joining the ship on-board. Last week saw the second of four rounds of negotiation at the UN towards a treaty covering international waters. The third round of negotiations takes place at the UN HQ in New York in August 2019, with the treaty process hopefully concluding with a fourth and final round in Spring 2020. A robust Global Ocean Treaty could provide the legal framework for the protection of international waters, making possible the creation of fully-protected Marine Protected Areas, or ‘ocean sanctuaries’, free from harmful human activities. Greenpeace is calling for a network of ocean sanctuaries covering at least a third of the world’s oceans by 2030, a target called for by scientists at the International Union for Conservation of Nature (IUCN) and welcomed by a growing number of governments. 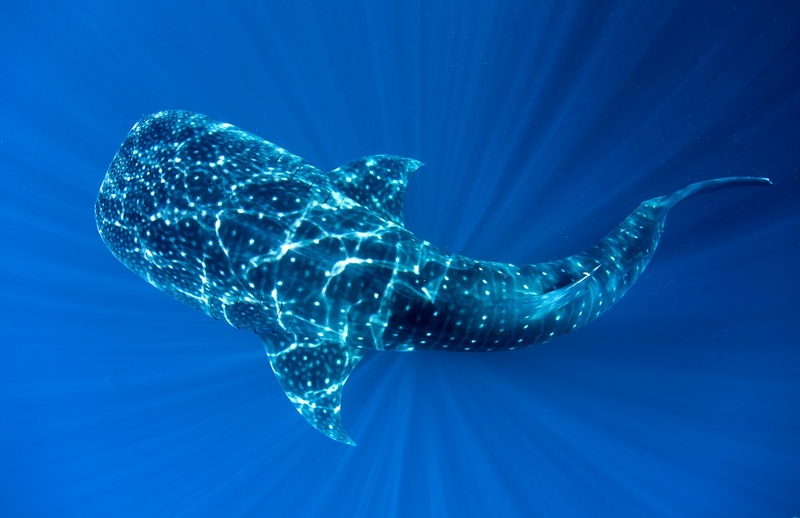 For more information, see: Protect the Global Oceans: Why We Need a Global Ocean Treaty. For a detailed policy briefing, see here.